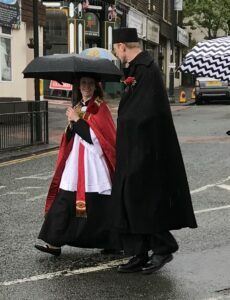 On Whit-Friday I joined the Vicar of Mossley and friends for a little walk (hike) around his parish. It was a wonderful event, and the people of St George’s Mossley are always very welcoming to visitors. The day began with the daily celebration of the Eucharist together in the Parish Church. It was a wonderful jamboree of mill-town life. My friends dressed up like Christmas trees for the occasion, as is their prerogative. The roads were closed, the traffic came to a halt, the people of the parish stood in the streets defiant of the weather, and the Church Militant trudged by. Mthr Penny and I were escorted around by the churchwardens with a large Brass Band alarmingly close behind. The logistics for such an event are not easy to organise, so thank you to everyone who made it possible for us to be there. A local preacher started the parade by announcing that people could talk to him about Jesus. I don’t know if people talked to him, but Fr David, Mthr Penny, Buddy the Dog and I had good conversations with people throughout the day – the sort of conversation where you feel privileged by the encounters. We celebrated the Eucharist together, joined in with the celebration, welcomed the opportunities for conversation and made time for people to tell their stories. So there you go: On Whit-Friday I joined Fr David and friends and we did the work of the Gospel. And don’t tell anyone, but I enjoyed every minute!